Just sticking a link to the main site, where I am compiling the episode table for Season Seven of House, based on how people vote in the polls. 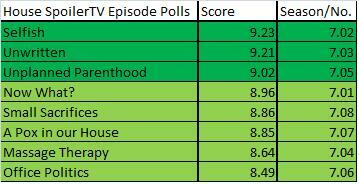 As you can see 7.08, Small Sacrifices is currently ranked 5th of the 8 episodes so far. Creator/Runner - 2010 SpoilerTV Show Competition - Supernatural. I agree, she has been. She's proving a different angle to look at the House character, which, afterall, is what the rest of the characters are doing. yes MMM is quite a refreshing change, i like the apperance of Kuno Becker in last episode, it was a while since i knew he worked.